Below is some sample check SMS Balance scripts prepared by our iSMS team. All available features and configurations will be displayed at the iSMS Developer API page. Integrate our SMS API into your C# application and enjoy our SMS services. Please register HERE to be iSMS member to obtain your iSMS account username and password. 1. You have to fill in your iSMS account details such as username and password. Then, click on button "Check Balance" to check balance. If you have not registered, please click HERE to get a FREE account with iSMS. 2. You credit balance will be appear as figure below. Beside that, there is a "Clear All" button is to clear username, password and your balance there. 3. 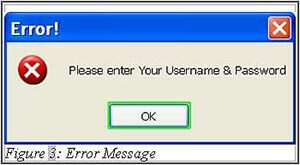 You will see an error message as shown in the figure below if you leave username or password fields blank. Click on "OK" to continue.